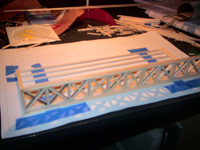 Designing and Building the HO Scale Howe Truss Float Bridge. Here is a simplistic design (for operating session) Howe type float bridge. I started off by printing the drawings I made a1 to 1 on my laser printer and laying the wood stock that I picked up from A.C. Moore. I used the blue painters tape to hold the frame together while the glue dried. Then I layered the cross members to get the desired affect. 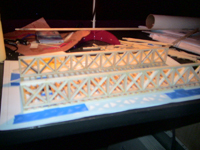 With a completed truss I started construction of the substructure. 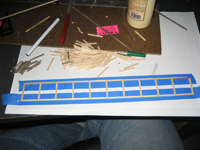 I use the same method of laying out the stringers and beams on a 1 to 1 drawing and using blue tape to hold the whole thing together until the glue setup. Here is the progress photo of the substructure. 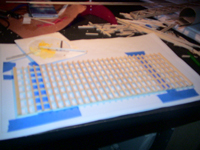 Again I use the plans to line up and glue the parts in place. 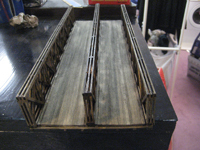 Here is the completed substructure of the float bridge. The next part will be constructing two more trusses and the decking . 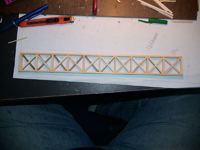 Here is another completed truss section for the bridge. There are 5 layers per truss. 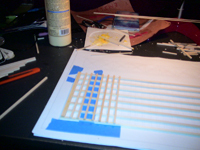 3 Layers are the boxed section with cross braces and 2 layers that ar just cross bracing. Here is the bridge awaiting the decking and the third truss. The decking will be made up of plank siding that I used for the pier and solid wood of the same 1/16" thickness to build up the deck height. 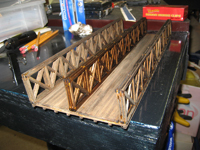 Here is a shot of the bridge with most of the completed assemblies. 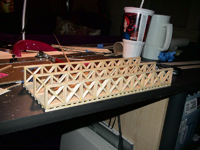 I still need to put the ties down with the rail and then attach the trusses to the bridge. The next step is a proper staining and painting. Here is the just stained deck. 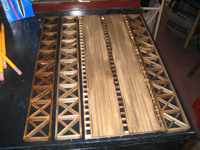 Here are the stained parts to the Howe float bridge. 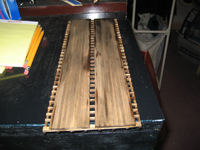 Here you can see that the parts are "dry fitted" after staining. The center truss is still drying. Another view of the drying "dry fitted" bridge.